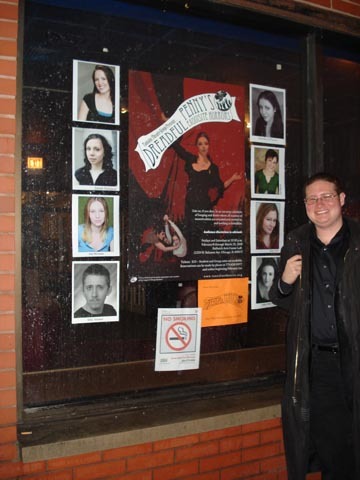 Long before I arrived in Chicago, Dreadful Penny’s Midnight Cavalcade of Ghoulish Delights was written by Tantalus Company member Matt Rossi and produced by Artistic Director Glen Cullen. The dark, menacing tale, modeled on every horror character you can imagine, performed that spring at Breadline Theatre in Chicago, and closed leaving only the memory of mopping up a floor covered in stage blood etched into everyone’s memory. Three years later Tantalus had just brought on four new company members, including myself. The artistic director planned to remount a previous production rather than create something entirely new with the young company, and we settled on Dreadful Penny. I took on the responsibility of the re-write. The workshop and scrip revision process was long and stressful. We met several times a week to read new pages and discuss the core characters – a dancer, a singer, a puppeteer, a stripper, and a freak – who were part of a traveling carnival that rolled into a different town each night, wreaking havoc on the lonely saps who came to view the performance (think Bradbury’s Something Wicked This Way Comes). 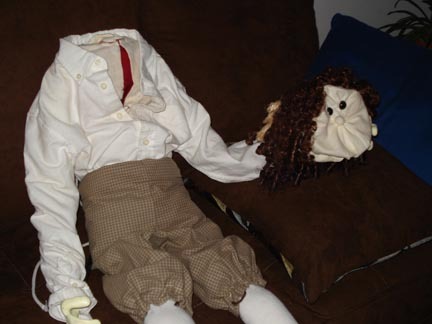 Puppet-In-Process: a prop I made for the puppeteer character. Each actor did a lot to help create their characters and develop their circus-routine performances, strung together by Penny’s soliloquies about love and desire. But even after a fun and successful February run at the Bailiwick Theatre we closed the show expecting that Penny’s darkness would never again appear on a Tantalus stage. Shortly thereafter, we learned that the show had been accepted to the Minneapolis Fringe Festival. 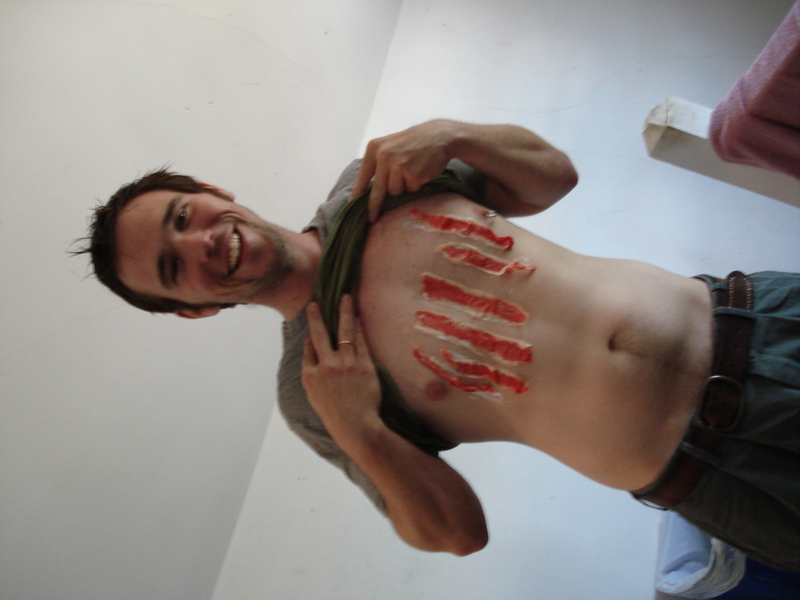 Mark's "bacon chest" was really a special effect - as Penny clawed at his chest she could peel off strips of his flesh and throw them across the stage. We spent the summer continuing to revise and edit, working to polish all the issues we’d come up with during the Bailiwick run. Then the seven performers, one director, and one writer packed all of our costumes and props in suitcases, boarded a Megabus, and went on a journey. We spent a week in the Twin Cities, performing one show a day at the Theatre Garage and taking in as much fringe theatre as we could possibly stand. Away from our home audience we fared slightly less well in terms of review, but we made up for it in spades in how much fun we had!